What's that I spy? A tear in the corner of your eye? Could you be mourning the final days of smoking in bars? As much as we all know that smoking is bad for you, it still seems like the end of an era today, the last day that you can legally smoke in restaurants and bars in Hong Kong. Most everyone is guilty of spewing smoke from their lips after a couple of cocktails nowadays, and it will be eerie to enter a club that smells of, well, probably sweat, instead of smoke. 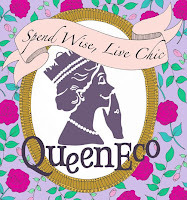 (Which is the lesser of two evils, I'm not sure). So I for one support the Mandarin Oriental's final homage to smokers, with smoky concoctions that recall the old days, when people still thought it was "cool" to smoke; when Marlboro man riding through the canyons was an image of romance, not revulsion; when Winona Ryder and Ethan Hawke, as their Reality Bites alter-egos, chainsucked cancer sticks with abandon and were still considered role models. Anyway, those days are gone, and in a handful of hours, so will be your chance to spew smoke without consequence. But for one final moment, be naughty, and consider these cocktails, as well as some canapes. "The Smoky Martini" - a twist on a classic theme comprising vodka and Islay whisky. 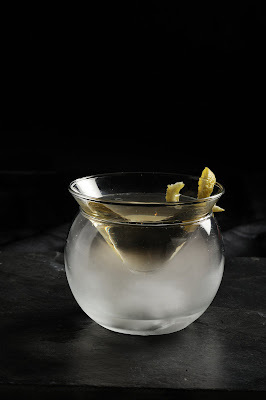 Innovative presentation features a stem-less martini glass delicately balanced inside another glass filled with dry ice “smoke”. The whisky in the martini is known for its smoky, peaty flavour with notes of iodine, seaweed and salt. “Cigar and Cigarette” – two different cocktails served together in tubes designed to resemble their namesake: “Cigar” is a liquid sensation composed of chilled chocolate liqueur and cream, while “Cigarette” is a tropical blend of rum, mango, coconut liqueur and coconut cream. 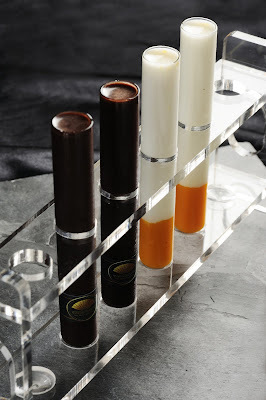 Light – styled in the shape of a cigarette; made of grissini stick and smoke-infused chocolate. Havana – a chocolate confection crafted to resemble a cigar; made of chocolate truffle lightly flavoured with a blend of Havana tobacco. Patch – inspired by a nicotine patch, “Patch” is a clear film served in a plastic dispenser that dissolves in the mouth releasing the subtle flavours of smoked bacon. All are available at both M Bar and Captain's Bar at the Mandarin Oriental, 5 Connaught Road, Central, GPO Box 2623, Hong Kong. Tel: 852 2522 0111.